In 2011 my youngest daughter Annelies dated a boy in Middleport NY. I noticed the road name signs 'Telegraph Rd' while driving on Route 31 from Lockport to Middleport. 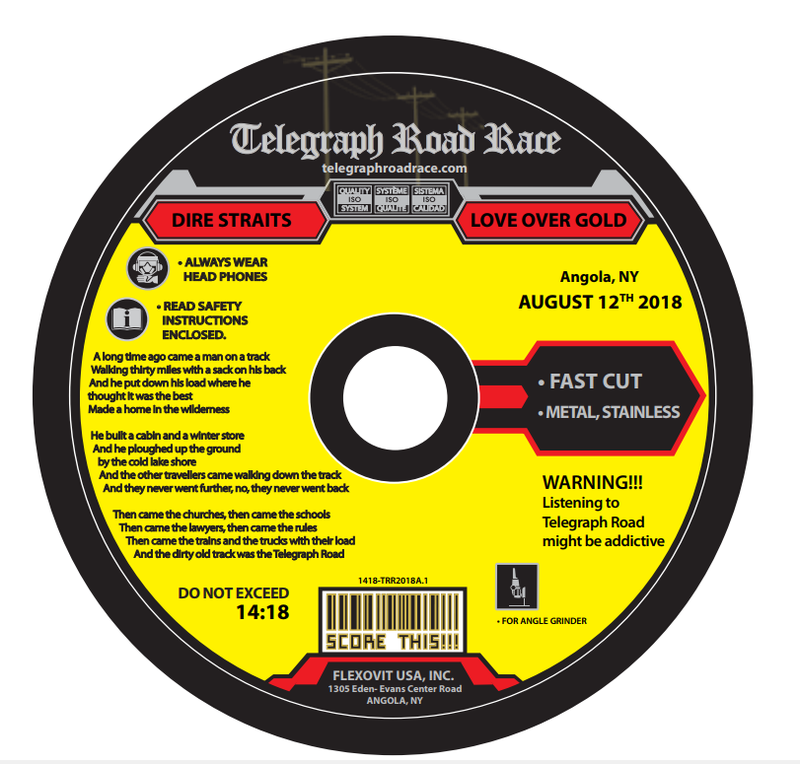 Being a lifetime fan of Dire Straits, I could not help but thinking of running on Telegraph Road while listening to the song Telegraph Road. The song is fourteen minutes and 18 seconds long. So needles to say I wondered how far I ( or anyone else) could run for a timespan like that. So why not have a race where runners run for fourteen minutes and 18 seconds, and see how far they run? The first objective was to find the location, since there are several sections of Telegraph Road east of Lockport. Google maps showed a nice remote section east of Medina near the Erie Canal. In January of 2012 I drove to this section and ran for fourteen minutes towards route 31 and back. It seemed like the perfect spot. I even asked at the local shooting range if I possibly could use their facilities. Memorial Day Monday was booked on the Buffalo Runners Race Calendar. The main objective of the race was to have 'Fun' and to put on the race for 'Free'. Getting closer to the race date, the Time Pirates were asked to play 'Telegraph Road' at the race. They generously accepted. The band needed electric power to perform, so Sandra Hebeler suggested moving the race to Gasport where she knew someone that could run a powercord towards the band. Starting at the railroad tracks and straight out towards the village of Gasport. Current world record by Jason Zayac : 2.6 Miles and Amy Fakterowitz : 2.14 Miles! Custom (white) Headsweat Bands for all participants. Starting at the Erie Canal bridge and looping for a half mile. Distance self measured by the runners. Custom (yellow and blue) Headsweat Bands for all participants. Starting at the Erie Canal bridge and looping for a quarter mile. Distance counted by number of Guitar picks received for each loop. Real close finish between the first and second male. 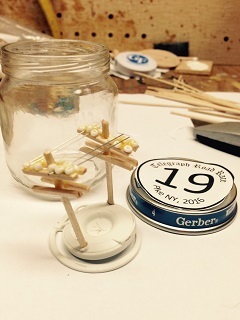 The most time consuming awards: Telegraph Poles in Olive Oil bottles. Jeff Sullivan told me at Y10 race in Lockport about another Telegraph Road in WNY. Genesee Road in Boston eventually changes to Telegraph Road in the town of Bliss. It ends in the village of Pike. Jerry Gasper (a co-worker of mine) build a house on Telegraph Road. He agreed to have the race start at his driveway. Starting at the driveway of Jerry Gasper going West. Distance measured by Leo McGorry using a Garmin. Tractor with Hay Wagon driven by Jerry Gasper to pick up the runners for the drive back. Custom Medals for all participants. Runners were given a small chip at the start of the race. The object was to run as far as you can uphill. Place the Numbered Chip on the side of the road. Return to the start/finish line within 14 minutes and 18 seconds. Sam Spritzer collected the Chips and recorded their distance from the start line. The recorded distance was doubled for those runners returning within the set time. The recorded distance was only counted once from those not returning in time. Starting at the Marina going East. Red, White and Blue napkins were handed to runners. They were asked to write their number on it. Jeffrey Scruggs drone took pictures of the runners at the end of the race. World's first DRONE scored race!! Sound System brought by Jeff Tracey played just Dire Straits during the entire event. Sam Spritzer manned the water stop and turn around point. Marty Gregoire from Footsteps of WNY was able to run the race and say some words regarding the benefit. Sheriff Patrol car ( last name of the officer: Morse! ). Special RWB and youth trophees. Mugs Root Beer was more popular than Labatt's Beer. Raffle of a bottle of Telegraph Beer and small Guitar. 2018: East Amherst OH: (CANCELLED DUE TO WEATHER). Starting at the Trainwreck Tavern going East. Start at the corner of Gowans Road and Route 20. Straight run (2.5 Miles) toward Flexovit Parking Lot. Town of Evans permission to rename Gowans Road to Telegraph Road for fourteen minutes and eighteen seconds. Donations towards Footsteps of WNY collected by the 'Man-on-the-Track' (Allen Formholtz). Finisher Medals made from Grinding Wheels, handed out by Sam Spritzer. Schoolbus from Flexovit Parking Lot to the Start. Start Shot by Inge Iliohan (her birthday). Distance measured by Jeff John via GPS. Special award for Diane Sardes. Tour of Flexovit USA inc by Bob Reihle. Demonstration of Grinding Wheel by Josue Natal.